This walk starts from near Annalecka bridge where there is a limited amount of parking perhaps for around 8 cars. After forest tracks it reaches Stoney Top via its north west then on to the top of Tonelagee which has some views, interesting even on the dull day we were there. The picture below shows the crooked forms of Croaghan Kinsella (left skyline) and Crouganmoira to the right. Drained of colour by the mist the resulting picture is reduced to almost abstract gray shapes. The nearer ridge has Camaderry SE Top, 677.3m. It doesn't look like much of a summit, but by the rules, this is a Vandeleur-Lynam standing 600m and 15m above the col joining it to Camaderry with just 26mm prominence to spare! The next furthest ridge with the track on it is Mullacor, 661m. Looking west there are more misty views. 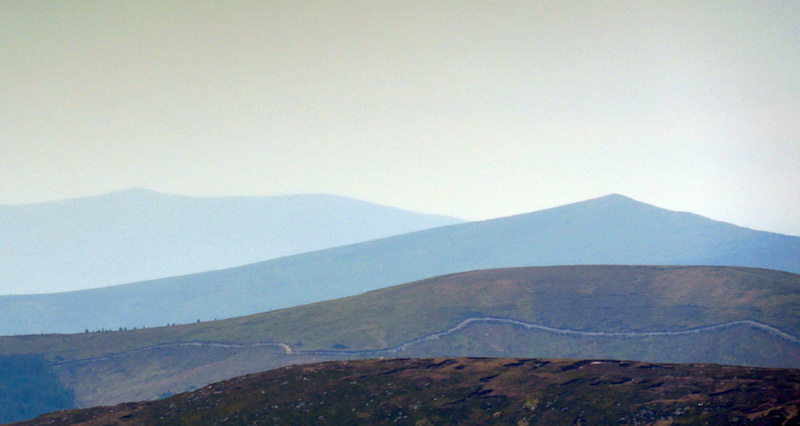 l-r Church, Slieve Corragh, Silsean and Moanbane. From the Wicklow Gap this route uses part of the St Kevins Way east. 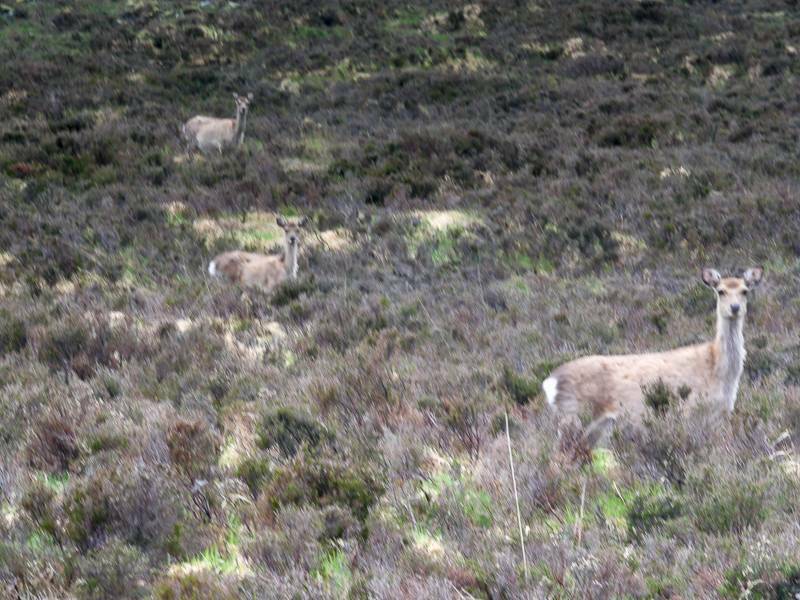 It was here that we encountered some curiously unafraid deer. Unfortunately I had my new camera set up for landscape. If you have tried it you know just how few seconds you have to take an opportunistic picture of wildlife and the need to take the damn picture. So it was taken at f16, ISO 200 which meant its exposure was long. 1/13 of a second long which is ridiculous for hand-held. And yet the new camera (Lumix GX9) managed extremely well in rescuing the picture from hand-shake under gloomy overcast, justifying its marketing claims of "5 axis stabilization". We returned by Lough Nahanagan, its lower lake fairly empty no doubt waiting to produce power by receiving water flow from the upper artificial lake visitble to right skyline. 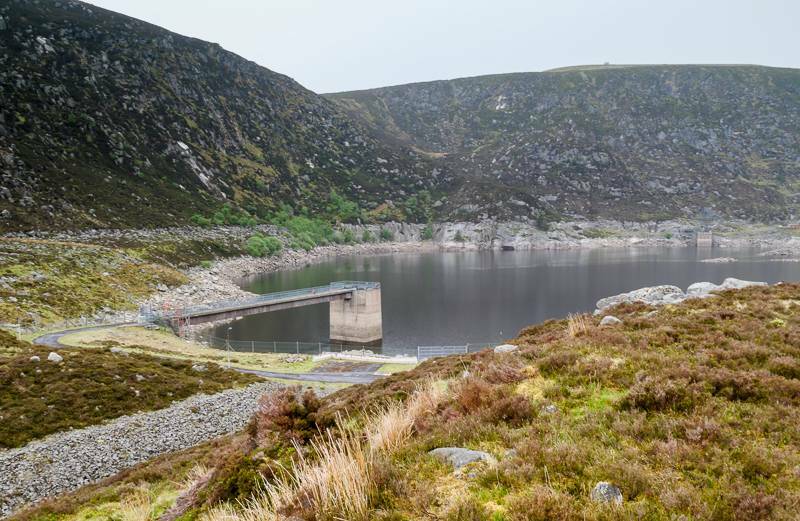 The works to the left corner of the picture are the spillway, presumably to deal with the situation where there is too much water in the lake. 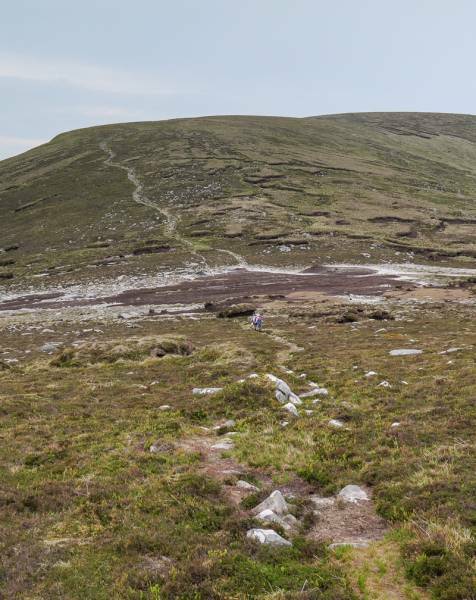 We returned via the Wicklow Gap and another bit of the St Kevins Way, which has been somewhat overtaken by recent forestry road construction.